We made the mistake, possibly as other do, of confusing Zenair Limited with Zenith Aircraft Co. – and we weren’t all-wrong. “Zenith”, while completely independent, is the US sister-company of “Zenair”. 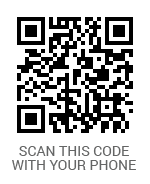 Being as we are a Canadian website, we’ll be talking about Zenair here. Zenair is located ramp-side off the Huronia Airport (CYEE), in Midland, Ontario. It’s facilities have expanded over the years and today, occupy three separate buildings. While Zenair mostly manufactures individual parts and sub-assemblies for its kit aircraft, it also offers advanced (QBK) kits, Firewall Forward Packages (FWF) for different engines for each of its aircraft, floats (more on this later), and it just launched a new Builder-Assistance program for its customers. The company sells world-wide and offers everything from single parts to practically ready-to-fly machines for 2 or 4 people. 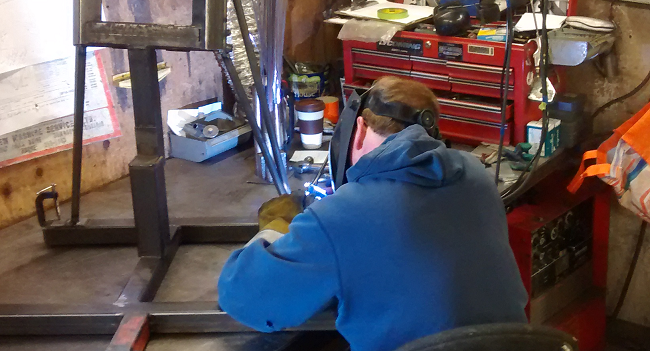 We met Michael Heintz at the Huronia factory, one of three brothers currently overseeing Zenair’s daily activities. He was welcoming and gracious enough to give us a full facility tour. The first thing we learned is that there are essentially three separate operations sharing the buildings we visited. Zenair focuses on designing aircraft and manufacturing kits and components for its kitplanes. As suggested by its name, Aircraft Floats Mfg. (AFM) manufactures and sells aircraft floats. The two brands of floats sold by AFM include aluminum floats (also made by Zenair) and the amazing range of Full-Lotus inflatable floats. The third entity (and newcomer to the group) is “Plane-Crafters”, a builder-assistance center designed to help builders assemble and/or complete their kit-plane projects. The group and their activities are well integrated, giving Zenair access to worldwide GA markets on a wide front – smart! Of course, the first thing we wanted to see when we arrived was the “shop” – where all those incredible components are made. We passed C&C machines cutting multi-templated parts, huge shears and bending brakes for the crafting of flat aluminum into aviation wizardry, and welders who demonstrated great mastery in their (exceedingly difficult) art. Skillful welding at the workshop. On seeing the unique skills evident in the on-site craftsmen, we asked about the abilities that a home-builder might need and were surprised to discover that kits can be assembled with just basic tools and knowledge. Virtually all of the fabrication is done for you with a Zenair-supplied kit – all that remains is the assembly work, and with today’s advanced matched-hole manufacturing technology, gone are the days of measuring (twice) before drilling each hole… The parts can be assembled together “right out of the box”! Assembly of the parts is with rivets, screws, and AN (Army-Navy) hardware (all provided in the kits). The factory is organized (as you would expect) to achieve the most economical and efficient flow of work and parts, with materials handling, production and storage all easily identifiable. Production was materials-based with aluminum, steel, fiberglass and vacuum-formed plastics all in different areas of the factory. 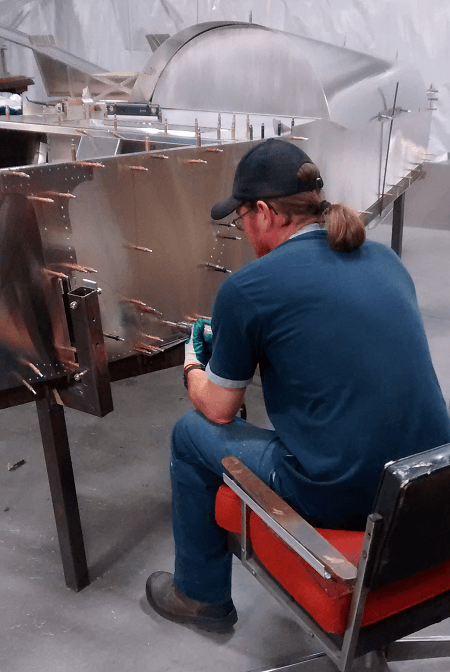 It’s easy to forget that Zenair builds almost every part for their machines here – so the skill-set is expansive. Wing construction showing ribs, spar and covering. 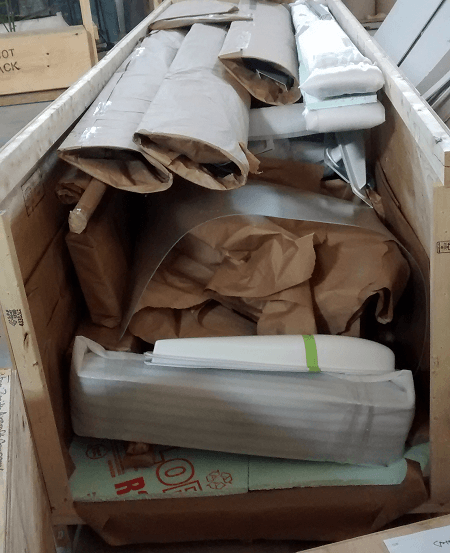 We soon went from the main metal-production facility to the separate fiberglass and plastics production section where we saw many molds with well-finished and smooth wing tips, engine cowls and many other white composite parts stacked in neat rows. As we entered another section of that building, we witnessed Full-Lotus floats in mid-production: Massive sewing tables with reams of vinyl fabric: grey, yellow and blue! What another fascinating Canadian product! In a corner, we could see the latest aircraft upholstery kits being produced, integrating beautifully embroidered factory logos… Very cool! Fibreglass cowl pieces ready for paint. The complete kits are carefully packaged in custom plywood crates, with every part required to make the contents magically transform and fly the blue skies (after some work by the builder, of course). 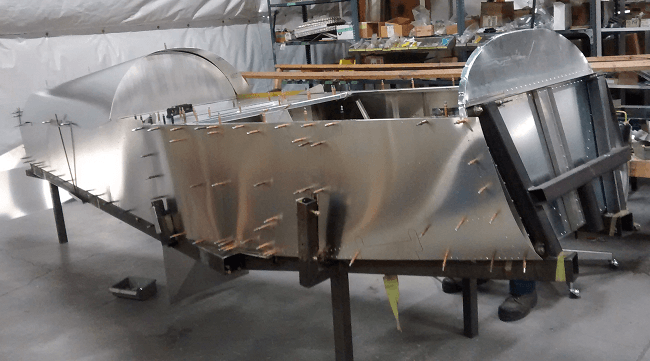 We saw the construction of a quick-build fuselage and it was easy to be fooled into thinking it was close to complete – Everything was so shiny! For sure, the expert work put into the quick-build kits make for an easier and quicker assembly, the rest of the project will still need a lot of builder attention though. Not everyone has the facilities, time or confidence to build an aircraft. Luckily, Zenair has found a solution for those buyers too. You can now spend two weeks at the factory and participate in a “Two-Week Wonder” program. That’s where two weeks after arriving (and practically living on-site), you’ll be able to take your finished plane out for its first taxi-tests – Wow! We learned that the majority of Zenair’s kitplane designs are registered in the Amateur-Built (AB) category by their owners. As aircraft owners, this gives them the most freedom in areas of aircraft modifications and aircraft maintenance. Other popular categories for these planes include LSA (USA) and AULA (Canada). That’s right – we said “AULA”, the Advanced Ultra Light (AULA) category – in which several Zenair models fit neatly. This category offers Canadian aviators easier licensing, less expensive maintenance and many other advantages – it’s worth looking into. Of course, if you’re Rec/PPL or above, you’ll probably register “Home-built” to take full advantage of the higher design gross-weight and many other options available to Zenair owners in that category. Now this was a factory tour, not a test-flying exercise, and we hope to get our hands on a Zenair machine later for comparison with the Cessna/Piper certified standard machines we’re all used to, but as an introduction to kit-planes, this was perfect. Without this tour, the “homebuild” market was a bit of a mystery to us, and relatively unknown – now it all seems easier, more “real”. Zenair is not a fly-by-night operation; I was both surprised and impressed by this visit! Pilots looking for an alternative owe it to themselves to look into this. Following our tour of the airplane parts manufacturing facility, we spent more time looking at the wide range of floats offered on-site by Aircraft Floats Mfg. The company offers seven sizes of aluminum floats and six sizes of inflatable Full-Lotus floats! All are available as straight floats; over half are also offered as amphibious floats (with wheels). 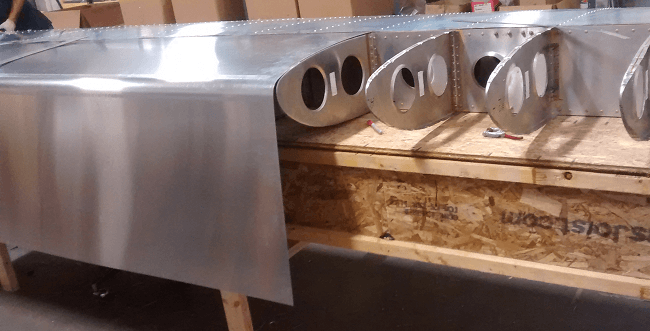 Naturally, a lot of the floats manufactured at Huronia end-up on Zenair designs, but Heintz told us that about 60% are installed on other makes and models of aircraft, including kitplanes, ultralights, and even gyrocopters! 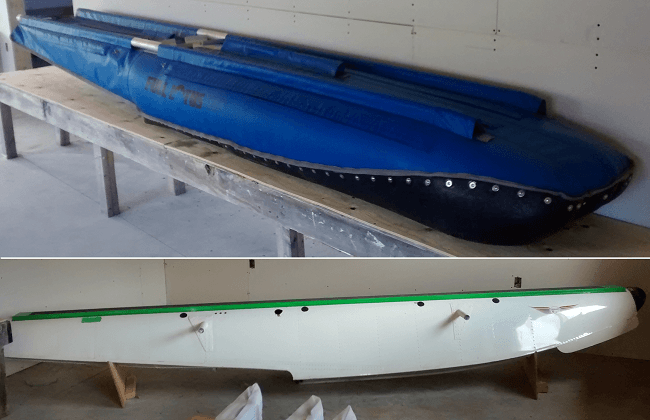 Full-Lotus floats deserve their own article, but imagine a less expensive, very robust, reinforced-vinyl, PVC-protected, inflatable-body float available from 950 – 2150 lbs and you’re getting the idea. They’re an all-season float good for water, ice and snow; they’re even available amphib (with wheels) for grass and/or paved runways! An innovative and interesting GA product we’re excited to learn more about. As Michael led, we ambled through the new Plane-Crafters facility and saw a number of aircraft there, in for maintenance, retro-fitting and experimentation (Midland is, after-all, where Zenair does all of its R&D work). This is also where we had a chance to climb-aboard a CH 750 Cruzer. The first thing you notice is the ease of entry through a massive lift-up door: No gear to step over, no struts to climb through, no wing to climb up on: just back-up to the seat, sit and turn to face the front. Even the centrally located control-stick is out of the way, making entry and exit from the 50″ wide cavernous cabin a breeze. As a 6-footer plus, and tipping 200lbs, absolutely no issue was found in accommodation. Again: Nice! CH-750 Cruiser panel – clean and simple. Heintz says the CH 750 Cruzer was born from the outstanding pilot response to the roominess, ease of access, comfort and visibility of this cabin – identical to its predecessor, the STOL CH 750. That aircraft followed in the tradition of the STOL CH 701 – a machine that redefined short-field performances in aircraft of this class. Owners of the Zenair STOL series regularly operate their kitplanes from 300ft. fields – that’s the sort of distance Cessna-drivers float in ground-effect! Zenair’s remarkable planes are not VTOL – but they’re pretty close. 750 Cruiser – check out the huge door and easy access. In retrospect, it would have been great to fly in a Zenair during this first factory visit, but it would just have been information overload. The factory tour whetted our appetite to see more of these aircraft – made in Canada – and we can’t wait to come back for more! Based on what we saw, this 40-year-old Canadian company knows what it’s doing, continues to manufacture and deliver quality designs, kits and programs, and our national GA is much the better for it! Thanks to all at Zenair, especially Michael who took the time to really introduce us to the make and family business.